I keep seeing accounts in the news about people who answer a knock on the door only to have an intruder (or possibly multiple intruders) use surprise and violent force to immediately rush through the door and overwhelm the person who innocently and unpreparedly opened the door. Here’s a very typical story here. This is a risk that is both surprisingly commonplace and hard to defend against. Say you have a concealed weapon somewhere on your person when you answer the door. Now think through what happens. You go to the door, unlock it (you do keep it locked, don’t you!) and open it. Maybe you get as far as to half open the door before – Wham! The person on the other side kicks into the door with all their force, pushing it hard into you and knocking you off balance. Before you’ve even caught your breath, they are through the door, and on top of you (quite literally, by this stage, you’ve been pushed backward onto the floor and may be mildly concussed) and have a knife at your throat. What use is your concealed weapon in its holster now? Now, so let’s notch the preparedness (or is it paranoia) up a further degree. You go to answer the door and you have a pistol in your hand, held inconspicuously behind your back. Only think about this if this is something you can promise yourself you’ll always do – and think it through. If you’ll always have a gun in your hand when you open the door, which hand will it be in? Which hand will open the door? What happens if you then need to accept a package from a delivery man? What happens if you then need to shake someone’s hand? Or hold a clip-board and sign a petition? Or maybe it is a friend who you invite in. And where will the gun live when it is not in your hand at the door? Okay, so you have answers for all these questions. You open the door, weapon in a hand behind your back, and all of a sudden, the men outside grab you and pin your arms to your sides. What good is the gun in your hand now? The sad reality is that we’re usually in Condition White or at the most, Condition Yellow when we’re in the deceptive seeming safety of our own home, in our familiar neighborhood, with no threats perceived nearby. We are not prepared for sudden and very violent attacks. But – just as you may commute some distance to work each day, so too do the bad guys commute to their ‘work’ – which in this case might mean to your house. When answering a knock on our front door, the physical proximity of us to an unknown person or persons (remember the 21 foot rule), and our natural politeness, optimism and hospitality, all work against us and for the other guy. My suggestion is simple and affordable. Forget about the peephole in the door. It doesn’t show you enough. Doubly forget about a ‘safety’ chain which is seldom sufficiently securely mounted to prevent a forcible entry. Instead, get a camera system. I’ve got a system that has two exterior cameras. One is some distance away from my entry area, and shows me the entire entry area, including around the corners that I can’t see from inside the doorway, and the driveway. So I can see who is at the door, if there are other people anywhere nearby, and if there are any vehicles on my property. The other is close in to the door, giving me a closeup of whoever is out there, so I can see and hear them. I know all about the person or persons outside my door before I even get close to the door. 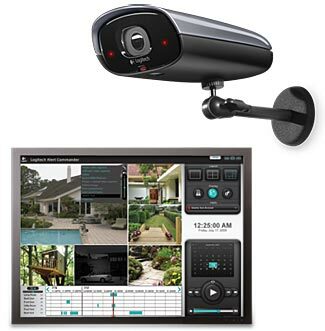 I can monitor the system realtime from a phone or computer, and when I’m not at home, it – together with other cameras inside the house – do double duty as an intruder detection system. It is a Logitech Alert system, and is affordable, excellent, and easy to install. Here’s a good review of it. I’m considering also adding an intercom to allow me to communicate with the person on the other side in what is comparatively normal a manner (through an intercom) rather than by calling out through the locked door, which seems much less normal. But generally the advantage of knowing who is out there and how many people there are is all the edge I need. These camera systems have been rare enough that there has not been (as far as I know) a widespread effort to use the remote access for the reverse intentions — for the bad guys to see with equal clarity if you are home and what your patterns of occupancy are, as well as what products and people you bring into your home. How long will this last? Who wants to be test cases? Hacking tools are widely circulated for free as well as sold. If valuable, there is no reason for access codes not to be sold individually or in bulk just as credit card numbers and social security numbers are. The remote viewing capability is user account and password protected. So you couldn’t buy an access code per se, neither could you create one. But if you knew a user’s login details, you certainly could exploit that. I never use the same password twice; that way if any of my login names and passwords escapes out ‘into the wild’ it is useless at any other site.